In the wordless communication that passes between Orcadian fiddler Catriona Price and Peebles harpist Esther Swift as they perform, the strength of their decade-long musical partnership, friendship and shared humour is evident. It’s this depth of connection, and tangible desire to have fun, that gives Twelfth Day its extra edge. In their own words, this is not so much a duo, but a two person quartet. Their two distinctly different voices, the fiddle, and the pedal harp, build layer upon layer of a complex and ever-evolving sound, rich with rhythm, harmony and texture. Twelfth Day are happy to be hard to define. Classically trained, they bring outstanding technical ability as well as an adventurous mix of folk, jazz and classical influences to their compositions and arrangements – blended with the folklore and inspirations of their respective Scottish Highland and Lowland upbringings. 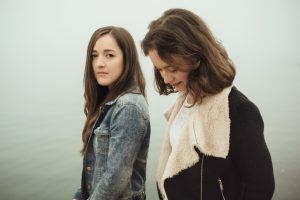 Esther and Catriona describe the title track Cracks as an “outcry” in response. This is a song about a woman trying to mould and cram herself into what’s expected of her; its rising hysteria brimming with the pair’s quietly wild humour. Cracks drags agonising internal struggles out into the light of day, and celebrates imperfection in all its beauty.